795 AD, the Vikings make their first raids on Irish islands including Iona, Rathlin Island and Inishmurrya. 1 December 1494 Edward Poyning, Henry VII of England's Lord Deputy to Ireland, issued a declaration known as Poynings' Law under which the Irish parliament was to pass no law without the prior consent of the English parliament. 1914, 18 September - Government of Ireland Act, providing for Irish Home Rule, passed but application simultaneously postponed for the duration of World War I. But there are two further dates that I think are worth considering adding to this list (with credit to Wikipedia for inspiration!). The first is 29 April 2016, which was the date that the National Vetting Bureau 2012 was fully commenced. All the dates in our list above were just another calendar day, in another calendar year. But, looking back, historians mark these dates as more than just another day in a calendar year. They’re like moments of reflection, when a country pauses, and realizes that something in the firmament of national affairs… has shifted. Sometimes that shift is visible – as with Viking raids. Sometimes that shift if less visible – when, for example, legislation is passed. 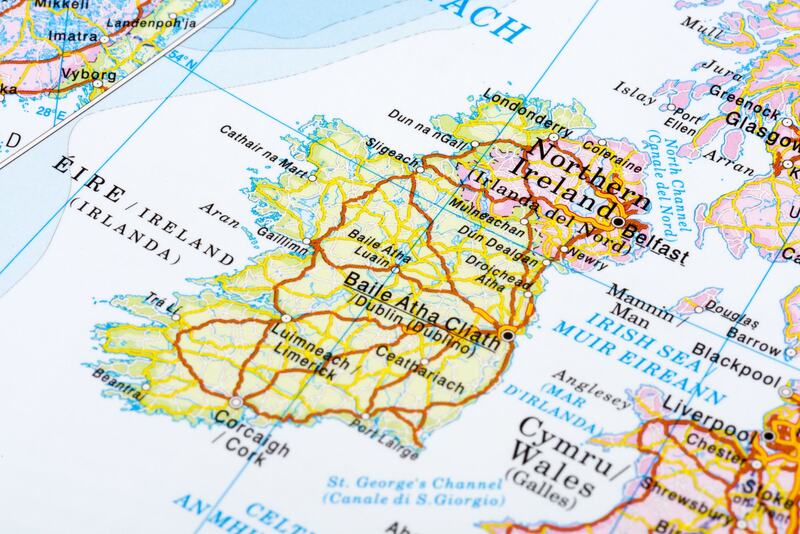 Something shifted in the Irish firmament on 29 April 2016, with the commencement of Ireland’s first every legislation mandating the check of a person’s criminal background, in certain specified situations. And something shifts on 11 December 2017. That’s the date that the final sections of the Children First Act 2015 are fully ‘live’ and out in the wild. (For completeness, the actual Act was signed into law by the President of Ireland 2015. Parts of it had been ‘commenced’ since then and December 2017. Indeed the heads of Barnados, the Childrens Rights Alliance, and the Irish Society for the Prevention of Cruelty to Children, felt compelled on 18 November 2016 to publish an open letter to the Irish Times. In that letter they decried the fact that a year after its enactment, only 3 of the Act’s provisions had been commenced. Happily, the full Act commences 11 December 2017. Now I don’t know about you but when I go on a journey, I like to know both my destination, and how I’m going to get. In the old days we used to rely simply on the old map in the back of the car. Today, however, with the advent of technology such as Google maps, we tend not to rely on the old map on the back of the car as much as we did in the past. 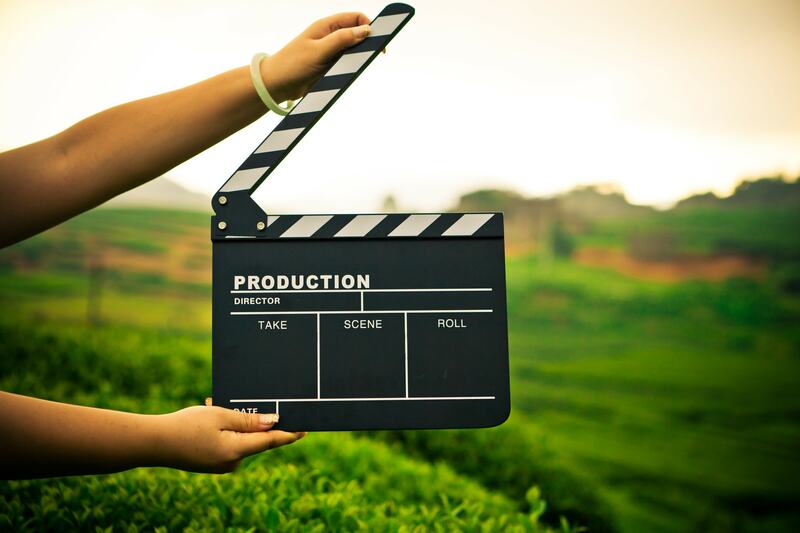 Now if there’s one thing that I have learned it’s that it’s often helpful to start with a clean slate if you intend to really get to grips with a field of interest to you. Many of the subscribers to the Complyfile blog are some of the leading child protection practitioners in Ireland today. Other subscribers are what people who put on the hat of child protection as they carry out their duties in voluntary positions of responsibility. Sometimes this is in a sports club. Sometimes this is in a charity. 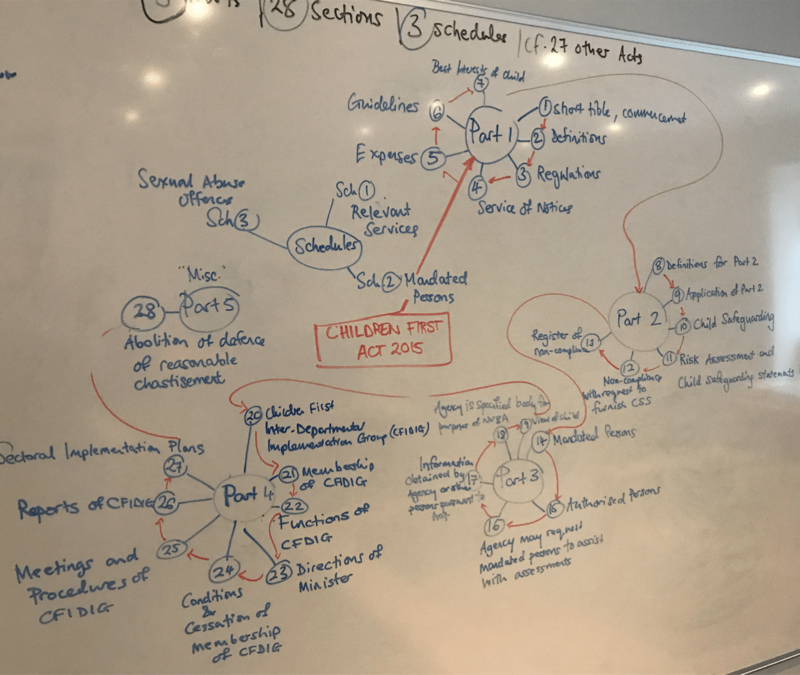 Either way, I propose that we try to learn a little more about the Children First Act 2015, along with other relevant documents and sources of knowledge. In the first instance, I will be taking you through the Children First Act 2015 on a section by section walk down the path that the legislators have laid out for us. 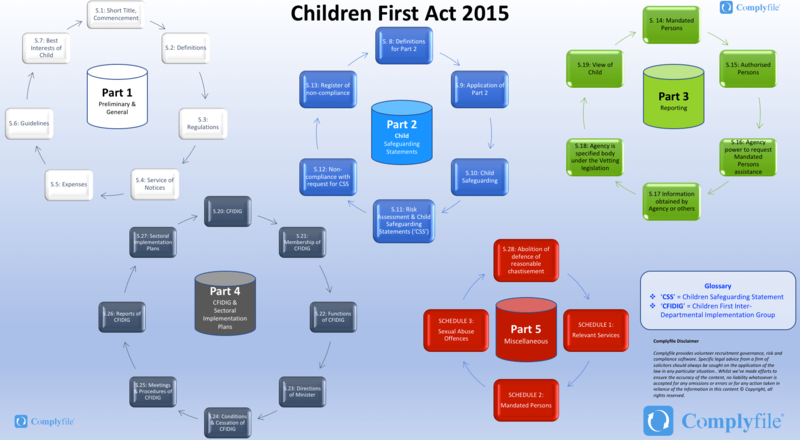 The Children First Act 2015 is made up of five main blocks (or ‘parts’). There are 28 sections in the Act. And there are three schedules (Included in Part 5 of the law). I then spent some time turning that into a one-page overview of the Act.